John Francis "Frank" Toolen was the second of nine children born into a prosperous, well-known and well-connected family in Chicago. 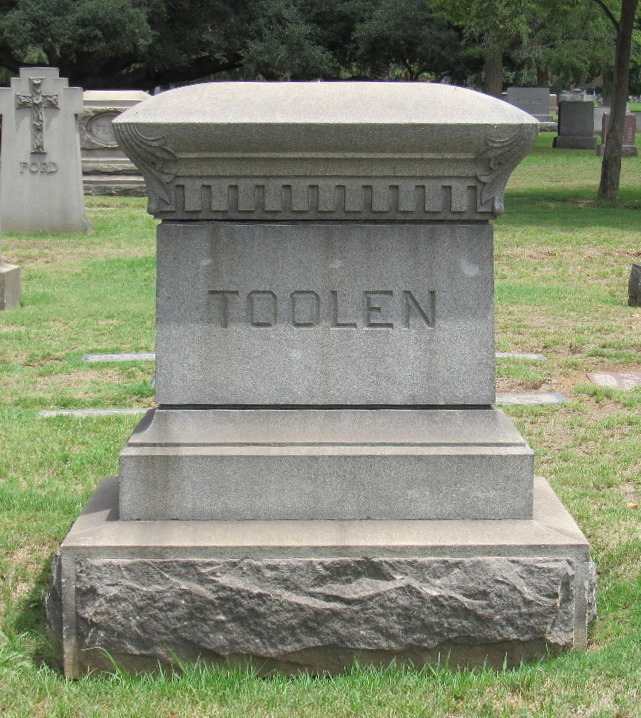 His father, Andrew J. Toolen, an Irish immigrant, Civil War veteran and construction contractor, was an active leader in city politics, a former Commissioner of Public Works and a close friend of the city's mayor, Carter Harrison. Even as a young boy in Chicago, Toolen was interested in police work. As a teen, he visited police stations and walked with the officers on their beats. When he received his law degree and went to work for the District Attorney's Office in Chicago, he specialized in cases related to the police department. In 1901, Toolen; his wife, Minnie; and their two young children moved to Southern California, where Toolen practiced law for a few years before finally realizing his dream of becoming a police officer when he joined the LAPD on Nov. 7, 1906. As quickly as possible under departmental regulations, Toolen took and passed the exam for sergeant, and was promoted on Oct. 31, 1910. In the pre-dawn darkness on Oct. 19, 1915, Toolen and his partner, Officer William B. White, went to a two-story house at 4941 Marmion Way, to arrest a 23-year-old man suspected of car theft. The suspect's mother answered the door and, after the officers searched the first floor, they headed toward the stairs to the second floor, but the woman attempted to block their way. As the woman kicked the officers and White struggled to push her out of the way, a shot came from the darkness at the top of the stairs, hitting Toolen at the top of his chest, and traveling through his heart, lung and kidney. White attempted to drag Toolen out of the house while several more shots were fired. As White called for back-up, Toolen's killer fled the house. Shortly after daylight, more than 100 officers, some assisted by bloodhounds, searched the area. Civilian posses were formed and searched for miles around the house. Toolen's killer was captured without incident the following day, near a railway station at Mission Road and Garfield Avenue in Alhambra. He admitted shooting Toolen, but said he thought the uniformed officers were burglars who were attacking his mother. 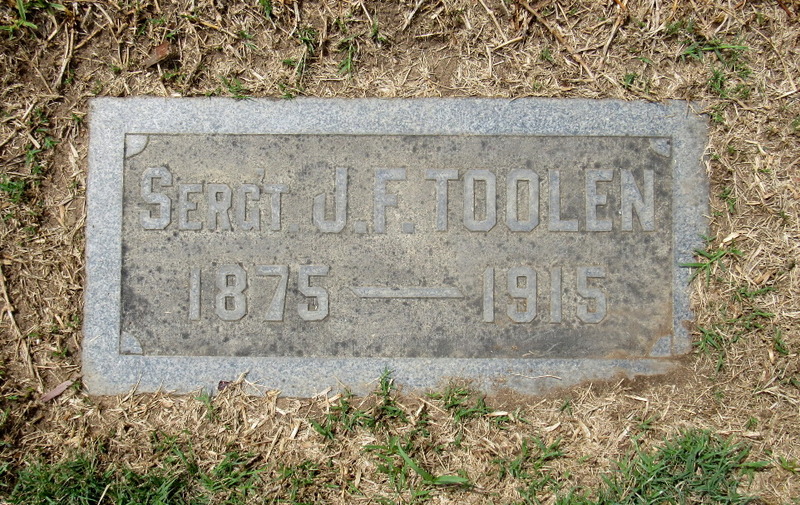 Toolen's killer was charged with murder and put on trial in April 1916. He was found guilty of manslaughter, and sentenced to eight years in prison. Toolen, 40, was survived by his wife, Minnie; their daughter, Cecilia, 18; and son, Andrew, 17. 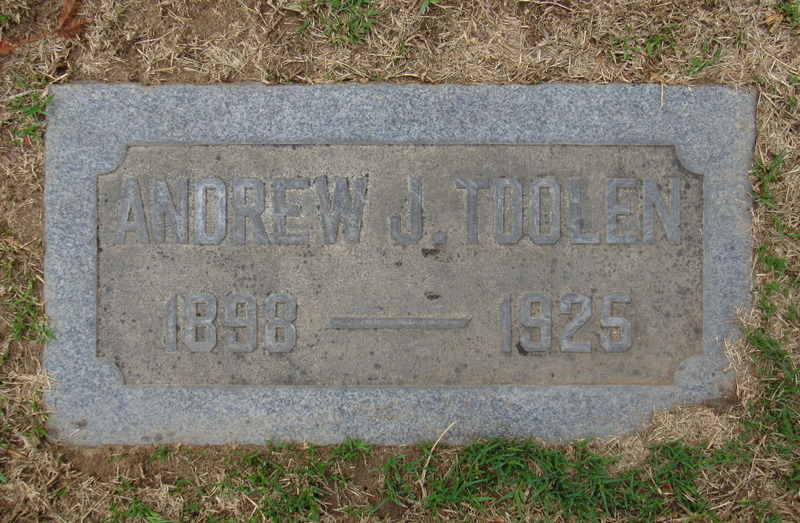 Toolen was buried at Mountain View Cemetery in Altadena, in the Toolen family plot, where he rests with his parents, Andrew and Hannah Toolen; his wife, Minnie; their son, Andrew, who died of typhoid fever in 1925 at the age of 26; a brother, Andrew; and a sister, Elfleda. Brother Clarence is buried elsewhere at the cemetery, and brother Arthur is buried in the Mountain View Mausoleum across the street. Toolen's sign is located on the northeast corner of Marmion Way and Joy Street.